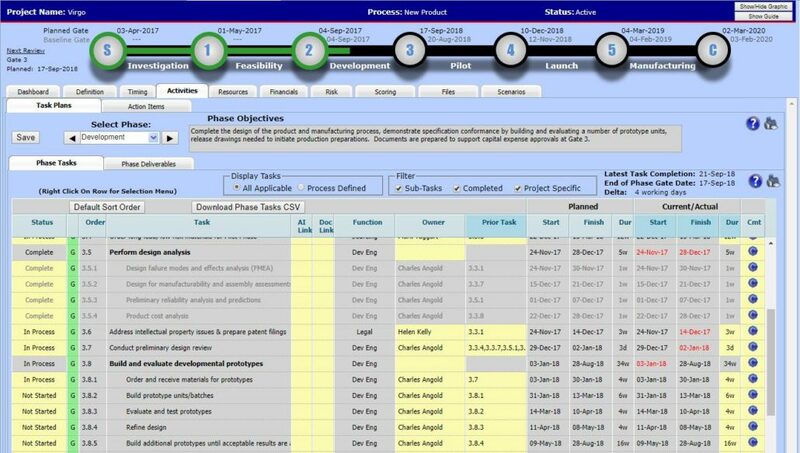 The phase/stage-gate processes of the organization (phases, tasks, deliverables and responsibilities) are captured in PD-Trak. Multiple processes can be established in Project Process Templates, e.g. new product development, product upgrade or product line extension, technology development or platform development. This enables a common process to be followed for a particular type of project, helping with compliance with ISO 9001. The Task Plans capture the objectives of each phase of the project, the tasks that must be addressed in each phase, and the documents that must be created or updated in each phase. As such, the Task Plans guide the organization to be consistent in how projects are to be conducted. The Task Plan contents are optimized for the type of project being managed. The Task Plans provide a common frame of reference for project planning, and ensure that important tasks (across all functions of the company) are not forgotten and are conducted consistently. PD-Trak provides a flexible approach to project planning and scheduling. The Task Plans allow start/finish/duration values to be directly entered for tasks, or tasks can be linked and the system then calculates task timing based on the first task in the linked sequence and the durations of the subsequent tasks. If a graphical interface is preferred, the project manager may choose to manage these tasks using the integrated Gantt Chart (MS Project® is required) – in this case, the task details are imported from MS Project® into the Task Plans allowing team members and managers to view task timing and status without needing MS Project® or a print out of the schedule from Project. When a project passes a gate, task owners for the next phase of the project are notified via email of their assignments on this project. When the project manager makes new task assignments within the current phase of the project, owners are notified of the new assignment. The project manager can request a status update through the interface – the affected team member receives an email with a link to a page that displays the assigned task(s) where they can provide updated status information and comments. Team members can go to the My Work page to see a full list of their assigned tasks and action items for all projects in the system. This page is used to capture low level tasks and actions that typically result from team meetings, customer meetings, design reviews, gate reviews, etc.